An increasingly uncertain security situation in Europe is driving Nordic countries towards closer military cooperation. From 2009, when they founded Nordefco, a military alliance, until 2014, when Russia annexed Crimea, Nordic countries saw closer collaboration as a way to save money by combining things like training and logistics. A common uniform is being mulled, but the main argument is that the increased purchasing power will allow them to buy better uniforms at a lower price. Recently, though, Denmark, Finland, Norway and Sweden have begun to look at how their alliance can help them in the face of growing concern about Russia. So far, the approach remains practical: One recent agreement makes it possible for the four countries to exchange air surveillance information. Another grants access to each other’s airspace on short notice. It may soon be expanded to apply to territorial waters as well. 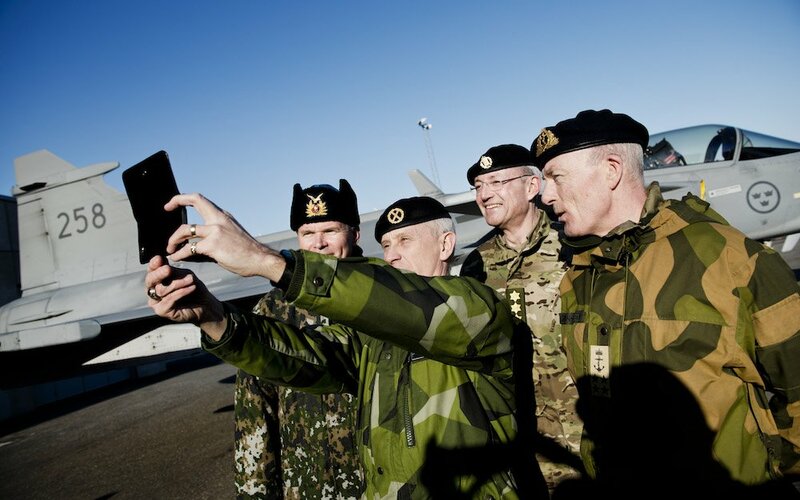 According to the defense ministers from the four countries, attending Sweden’s Sälen security conference on Monday, further Nordefco agreements that permit their militaries to operate more closely are likely in the years to come. Denmark, for example, suggests holding more exercises that involve the four countries and creating a Nordic defense attaché. All four countries admit that the closer cooperation has been spurred on by Russia, but they build on existing cozy relations amongst the five Nordic countries (Iceland, with no military, is not a part of Nordefco), as well as a desire by non-aligned Sweden and Finland to stay close to NATO. The matter of Swedish and Finnish membership of NATO is something that comes up regularly in the two countries — and results in a prompt warning from Moscow of the consequences of either country seeking outright membership. For now, there is more support for staying out of NATO, but both countries have made their allegiance clear: both belong to the EU, both take part in NATO-led exercises and both join with Denmark and Norway in expressing their uncertainty about whether Russia is a foe. For now, that factor is forcing the Nordic countries to again focus on territorial defense rather than the international operations of the 1990s and 2000s, when Denmark, Norway and Sweden in particular sought to turn their militaries into leaner, meaner — and smaller — forces. None of the four defense ministers said they lived in fear of a Russian invasion — and all four understood that Moscow could misinterpret their moves — but nor did they reject the possibility that their countries may need to defend themselves from an attack. “Looking ahead, the tensions are not likely to go away soon, not until the overall security situation in Europe improves. The visibility ahead of us is very limited, fog of conflict has increased. That leaves us with uncertainty and unpredictability,” Niinistö said. And although they sought to downplay the threat of a traditional military attack, the defense ministers suggested that attacks in cyberspace were already routine. Nordic countries, all of which have moved most banking and many public services online, would all be particularly hard hit by hacking, and thus take such threats perhaps even more seriously. Denmark, which will hold a general election later this year, has been watching other European and North American elections for the past two years to try to figure out how to shield itself from foreign misinformation campaigns. But even though they fret about possible Russian shenanigans in the real and virtual world, all four countries, noted Claus Hjort Frederiksen, the Danish foreign minister, collaborate with Russia, in particular in the Arctic.